The nation's most visited national park sits equally divided between North Carolina and Tennessee, roughly 40 percent of which is located right here in Swain County. While many enjoy experiencing the park by riding US 441, there are many enjoyable experiences to be had right close by. Deep Creek is one of the most popular areas of the Great Smoky Mountain National Park. 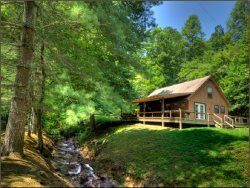 Located just 5 minutes outside of downtown Bryson City, Deep Creek is known for it`s whitewater tubing, swimming holes, hiking, three waterfalls, and fly fishing. Click the link below for a printable map of Deep Creek`s trails and waterfalls. Official Visitor Center for the Great Smoky Mountain National Park. There is a small museum that celebrates 19th century life here in the Smokies, as well as having artifacts and literature of the era and history of the National Park. Best part is it`s absolutely free! While you`re there, check out the gift shop for a great deal of information about the area, gifts, apparel, literature, and guides. Located right behind the Oconaluftee Visitor Center, The Mountain Farm Museum is a re-creation of mountain life in the 19th century. The farm is comprised of original structures that were relocated from throughout the National Park. During the summer months, the farm comes to life with livestock and crops that were grown during the time period. This is an area must see as it gives you real insight into mountain life and history and it`s absolutely free! Located just half a mile from the Oconaluftee Visitor Center, Mingus Mill is a fully operational grist mill that was built in 1886. The mill is open from mid-March to mid-November, 9:00 - 5:00. Newfound Gap is the lowest drivable pass in the Great Smoky Mountain National Park. At an elevation of 5,046 feet, you can enjoy gorgeous views while sitting on the North Carolina/ Tennessee state line. Clingmans Dome is the highest peak in the Great Smoky Mountain National Park. At 6,643 feet, it ranks third highest mountain east of Mississippi. Clingmans Dome is just a seven-mile drive from US 441 at the peak of the Smokies. There is a steep half-mile trail to the observation tower at the peak. Guided horseback riding tours, located just north of Cherokee.